Europe is a mess. Should American investors buy now? Savvy investors know that often the time to buy is when things look ugly. Right now, Europe looks pretty disheveled. Greece is back in drama mode. It has too much debt that it can't pay. Negotiations with Eurozone leaders this week have been tense, with no resolution yet. There's even talk of Greece leaving the euro, which would only embolden separatists in other parts of Europe. On top of that, Europe's economy is sputtering. There are fears of deflation, too, which one hedge fund manager compared to the Death Star from Star Wars showing up. 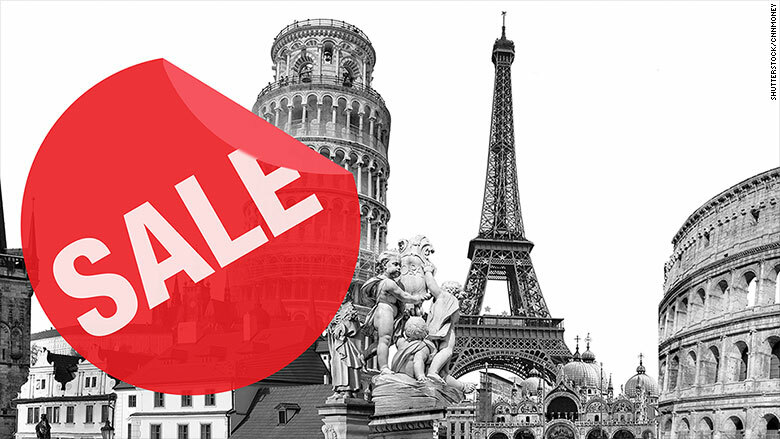 The case to buy: The warning signs are plentiful, but from an investment standpoint, European stocks look very cheap, especially compared to the U.S. That, arguably, makes it a great time to buy. "We are definitely of the opinion that this year Europe will outperform the U.S.," says Martin Schulz, manager of PNC Capital Advisors' International Equity Fund. "We think corporate margins and earnings growth is peaking in the U.S."
A European market rebound is already underway. The STOXX Europe 50 Index is up over 9% this year and the German DAX is up nearly 12%. Compare that to the Dow, which is up only 1% for the year. Experts forecast European markets will outperform America this year. Many large European companies are still doing well, and Germany reported better-than-expected economic growth Friday, a fresh reminder that there's still money to be made. Greek pickle: Most believe the Greece situation will be resolved without having to resort to Greece leaving the euro or another dramatic turn. It's in everyone's best interest to find a compromise. "At the end of the day, Germany is very invested in the long-term health and existence of the European Union," Schulz says. If anything, the Greek drama could provide an opportunity for investors. Beyond Greece, Europe's central bank is gearing up to stimulate the economy. The U.S. Federal Reserve did the same thing in recent years, which many credit as a key driver of the nearly six-year upswing in the American stock market. "What quantitative easing did do in the U.S. is inflate asset prices," notes Lori Heinel, chief portfolio strategist at State Street Global Advisors. Europe could be next in line for a boost. The euro dilemma: But there's one big concern as an American investor: the U.S. dollar-to-euro exchange rate. Schulz says it's quite possible European markets could finish the year 10% higher, but after the exchange rate, an American investor would only be looking at, say, a 4% gain in dollar terms. "The whole concept is you want to be in Europe, but you don't want to own the currency," says Mary Ann Bartels, chief investment officer of portfolio strategies at Merrill Lynch. There are two schools of thought on how to deal with it: Either try to hedge or just live with it. For long-term investors, currency effects typically wash out over time, Bartels says. But investors who are concerned about the one-to-three-year performance of their investments have to pay attention to the exchange rate. Some funds that cater to retail clients will actually hedge out the currency effects for investors. They are harder to find, but they are there. "What we are recommending as you invest in Europe is to stay with high-quality, large-cap companies and to keep in mind a lot of exporters will benefit from the depreciating euro," says Bartels. But while investment strategists are mixed on whether to overweight or underweight Europe and other international equities, they largely agree that you should have some exposure if you don't have it already.